Devils, demons, and daemons--these are the ultimate servants of evil. 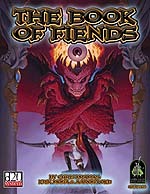 Learn all their foul secrets in The Book of Fiends, the definitive sourcebook on these fell creatures. Here we present to you but a tiny sampling of the stunning art you'll find in The Book of Fiends, available now at your favorite gamestore.